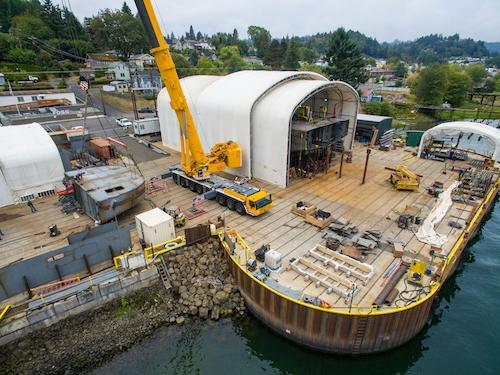 RAINIER, Ore., – Foss Maritime has released two time-lapse videos of the construction of the third of three state-of-the-art Arctic Class tugs being built at the Rainier, OR. shipyard. The tug is expected to enter service later this year. The tug is ice class D0, meaning the hulls are designed specifically for polar waters and are reinforced to maneuver in ice. Like her sister Arctic Class tugs, it complies with the requirements in the ABS Guide for Building and Classing Vessels Intended to Operate in Polar Waters, including ABS A1 standards, SOLAS and Green Passport. The short videos show construction from April of 2016 to January 2017. The first of two videos shows the hull assembly, construction, flip and installation of the bow and stern modules, the installation of one of two Caterpillar C280-8 main engines, the superstructure install, and wheelhouse construction. 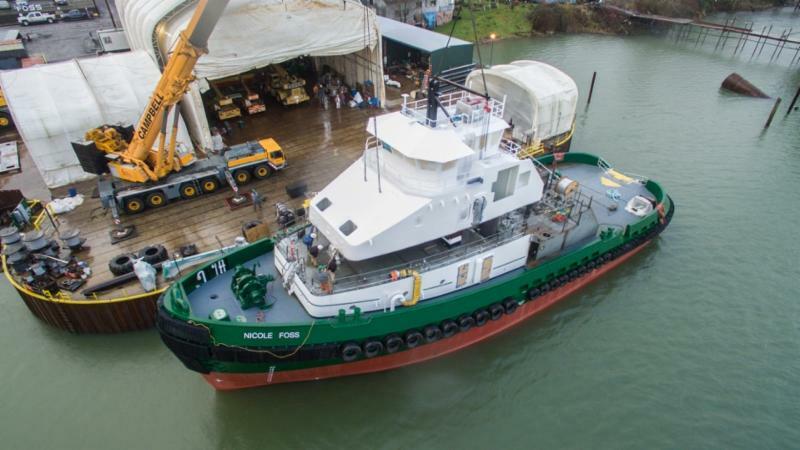 A second video shows construction through the transportation of the Hull – which has Nautican’s high efficiency nozzle and rudder assembly, driven through a set of Reintjes reduction gears – to Vancouver, Washington to have a Markey Machinery tow winch installed, before returning to Rainier for her wheelhouse installation. The videos are also available on the Foss YouTube channel, or on the Foss website, with continuing updates and photography available via inquiry, or on social media at Facebook, Instagram, Twitter and LinkedIn.